If you love to entertain, you need a dining space that can accommodate dinner for two or a large gathering of friends and family. Here are five design tips to help you maximize seating and create a flexible dining space for every occasion. Adams extension table with Ava and Doyle dining chairs. 1. Consider an extension table. Extension tables are the ultimate entertaining solution. Extend them when you’re welcoming guests, close them up once they’re gone. An extension table with the legs placed at the corners of the tabletop, like our Andover or Opla tables, gives you the most room for chairs. 2. Short on space? A round table is the way to go. If you don’t have the room for a large table or one that extends, a round table with a pedestal base is great for two reasons: 1) it’s easier to comfortably fit more chairs around a circle than a square or rectangle and 2) a pedestal base (one column under the center of the table instead of four legs) means you’re never bumping knees with the table legs. Another bonus of round pedestal tables like our Aria, Madison or Saarinen tables: they encourage conversation because everyone can see each other and no one is out of earshot. A round Saarinen table, narrow Doyle chairs and a counter-height storage cabinet (similar here) gives this small dining space big flexibility. 3. Choose a narrow chair. In an ideal world, each guest would have 24 inches of space to themselves at the table. But if you want to get cozy for a big gathering, narrower chairs make that easier to do. Our Doyle, Afton, Georgia, Bellini, Hirsch, Hopkins and Sabrina chairs pack a lot of comfort into only 18 inches of space. 4. Pull up a bench. A typical bench can seat three to four adults, and even more kids, usually in less space than chairs would require. When the meal is finished, you can tuck them completely under the table or relocate them to your entryway or the foot of the bed. Designs like our Chilton bench or Andover bench make a statement in solid wood, while upholstered benches like Collins offer more comfort. 5. Double your serving space with a storage piece. A counter or table height dining storage cabinet gives you another surface to use for serving. Use the top to set up a drink station, arrange a buffet of food or stage dessert. In addition to the convenience of having all your serving pieces and glassware nearby, you’ll appreciate the added space to serve family and friends. Want more dining room design ideas? 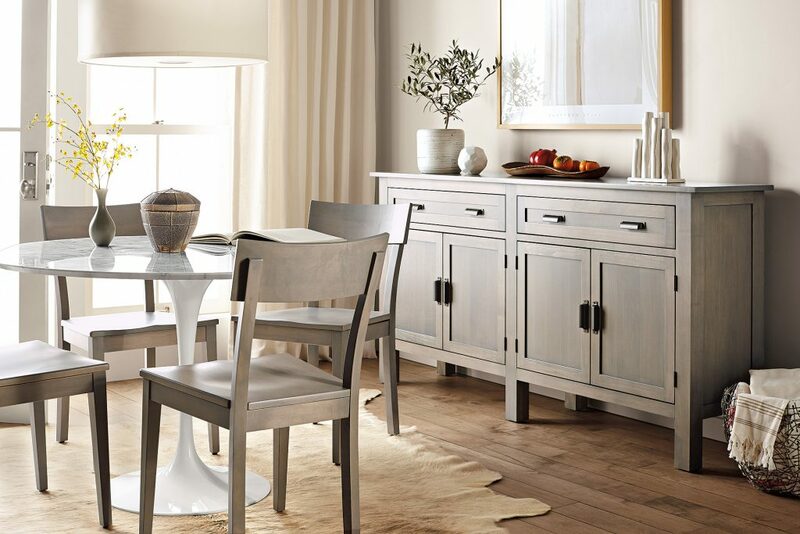 Check out our Dining Table Guide or browse our Dining Room Inspiration Gallery.